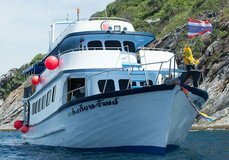 Khao Lak diving day tours normally start with your hotel pick up at 08:00 hrs, and return to your hotel at 16:00 hrs, but will vary depending on dive site distance on the day. The boat departs from Baan Namkhem Pier. Boat journey time is a maximum of 80 minutes. 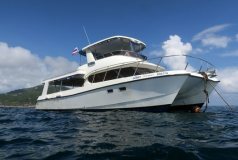 Rest assured, you'll be diving from only the best daytrip speedboat available in Khao Lak, both in terms of comfort and service. It takes only 15 divers with 3 divemasters. For more information visit: Khao Lak dive sites. 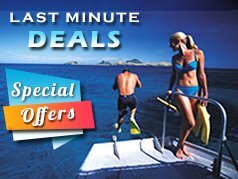 Khao Lak hotel to/from boat transfers, national park fees, lunch, fresh fruit, soft drinks, dives, weights and weight-belts, tanks, professionally qualified divemaster, and taxes. Full set of rental dive equipment US$ 16, dive computer US$ 16, dive insurance (mandatory). Unless otherwise stated, all the listed items need to be paid on arrival. There are no hidden extras in the trip prices quoted to you. Diver experience: All guests must have dived within the last 6 months to join trips to Richelieu Rock and Koh Tachai, and within the past 12 months for all other trips. 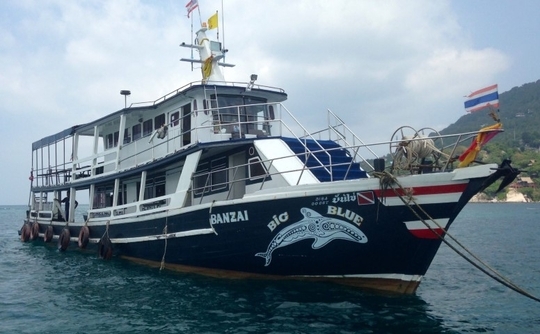 Non-divers and snorkellers US$ 101 per day (Similan trips only).